Cepheus (see’-fee-us) is a dim constellation named for the mythological king of Æthiopia (not our present-day Ethiopia). Cassiopeia was his queen. 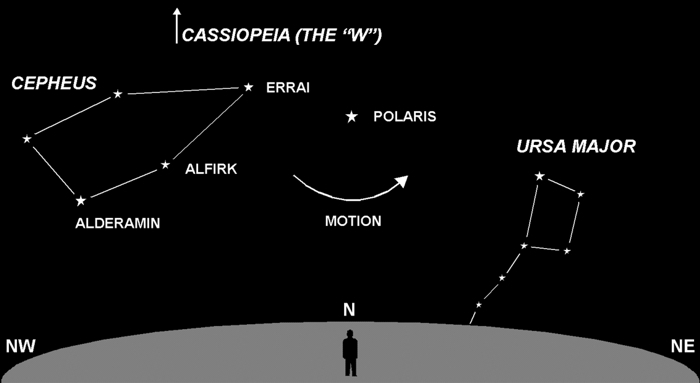 Like Cassiopeia and Ursa Major, Cepheus is one of the circumpolar constellations that appear to revolve around the north star Polaris. Of course, this apparent revolution is due to Earth’s rotation. If you come back out to observe an hour from now, you’ll see Cepheus and Cassiopeia lower in the sky, and Ursa Major higher. After 24 hours they will all be back to about the same place.